We are always training the horse both physically and emotionally. Physical training is easy to measure; the horse stops better, spins faster or steers easier. Emotional training isn’t always as easy to see. A horse that is very stressed may show signs of stress through physical movements; pawing, prancing or sweating or they may withdraw and get a glazed over look. that the non professional may go to the other extreme and worry more about whether the horse likes them (emotional) and be more likely to overlook the horse being pushy etc. I think that there needs to be a balance between both. The horse needs to physically respect our space and listen to us but we also need to take into account what the horse is emotionally going through. 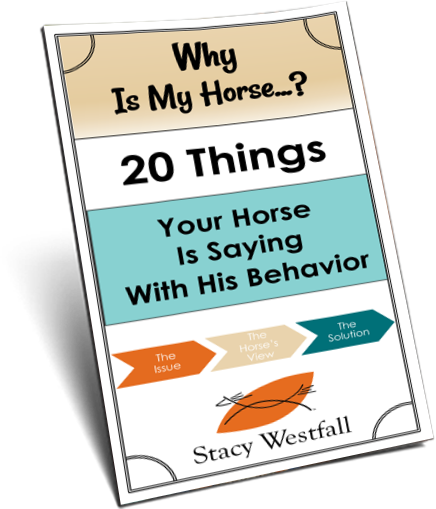 Just like building a relationship with your kids, spouse or a friend takes time, teaching a horse emotional lessons takes time. Often this ‘time’ is less structured time than traditional training although the main difference is getting the horse to think outside the box. This could mean that I add unusual obstacles to my ‘normal’ routine, or it could be that I take my work out onto the trail. When I was training Jac, he was more like a blank slate. He had very little training but he also had few preconceived ideas on how things were going to go. With Al, and most older horses, this was not the case. Al has a history of training and he has learned that one system. There are pieces of that system that worked well and will carry over into Al’s next career, but there are also parts where he could improve. As soon as I said more comfortable, did your mind conger up images of extra bedding, fans and padding on the halter? Typically when people think about making something ‘more comfortable’ they immediately think about physical comfort. The discomfort Al was having was emotional, not physical, and I know this because I hauled him with other horses. I know they were physically dry and comfortable. What Al needed was emotional training. I hauled Al on multiple occasions and repeated this same routine; short trailer ride (15-20 mins), unload, saddle, pony, unsaddle, load, return home. On each trip Al was less nervous in the trailer and by the time I returned him to New Vocations he was not showing any signs of emotional stress when hauled. The other effect of hauling Al was that I was able to give him lots of new things to think about including trails, crossing logs, and playing in a stream. This is some of my favorite training to do with horses. Can you see how keeping the core lesson the same while varying the routine adds strength to the training? ← Conversation starter: If money were no object, what kind of party would you throw and where? An excellent video and post from Stacy Westfall. 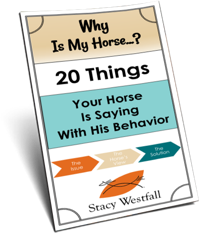 I am guilty of this myself, putting a time frame on a certain aspect training wise and forgetting that we need to take into consideration the horses emotional learning steps as well. Popcorn showing Al how to enjoy life! it looks like Al sees Popcorn as a ‘big brother’ or looks to him for reassurance? thanks for your work producing these thoughtful videos and commentary. Loved seeing Al enjoy the water!! WOW… PopCorn was pawing right with the beat of the music…..lol……..Great video! I have ponied from mares without an issue. The determining factor is how well trained the horse is because it is important for the rider to have control of the lead horse. I have an emotionally stressed horse who is so scared of men that he bucks men off, won’t let my shoer near him but me, my mom, and kids can do anything with him. He has tried to buck me off once when I first got him. I have done lots of ground work and pony him and just go for walks leading him. I get on and off when he drops his head and settles down but I still do not trust him 100 %. I have had all medical issues ruled out and have decided that’s it’s completely emotional. I don’t want to think about what he’s been through but replace with good habits. I guess what I’m asking is what if he never gets over it and im assuming bucking has always been his defense and it’s worked for him in the past. I have all the time an patience in the world but I’m out of ideas. He’s so great on the ground just riding he’s so nervous. It sounds like you have a big project. You are on the right track in several areas. You are probably wise to not trust him completely. It is also possible that you could replace enough bad habits with good. It is also possible that, just like people who have been changed by trauma, he may have been permanently changed by trauma also. You have lots to think about.